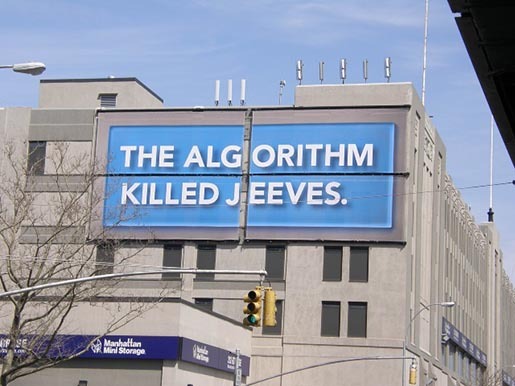 The algorithm killed Jeeves. The Algorithm is from New Jersey. The Algorithm Constantly Finds Jesus. The algorithm is banned in China. The Unabomber hates the Algorithm. These are the messages seen on billboards, bus shelters and transit stations in New York, San Francisco and Los Angeles this last month – part of a campaign designed by Crispin Porter Bogusky for Ask.com to reposition itself as a search engine using reliable and consistent algorithms and worthy of competition with Google. Greg Ott, VP of marketing at Ask.com says the Algorithm is on the move, in his post at the Ask.com blog. He writes that Ask.com has been working with their new advertising agency Crispin Porter + Bogusky to create a campaign that champions “The Algorithm” and how it brings good search to life, from plain old ‘ten blue links’ to popular, algorithm-driven features such as Smart Answers and Zoom related search. So what would the billboard be saying to the average viewer? 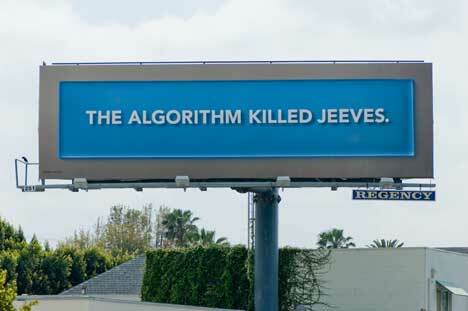 “The Algorithm killed Jeeves”. The search engine, owned by IAC, grew out of the “Ask Jeeves” web site, connected with the butler of PG Wodehouse’s character Bertie Wooster. Jeeves was phased out in early 2006. Ask.com acquired algorithms from Teoma and Direct Hit in 2000 and 2001, developing what is known as ExpertRank. What they need us to know is that Ask.com searches are based on fully automated, reliable and regular analyses of the billions of web sites around the world. No longer do we ask Jeeves. We ask the algorithm. 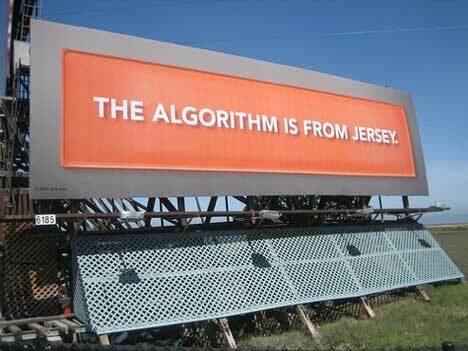 “The Algorithm is from Jersey”. Teoma was developed in New Jersey. Thomas Edison lived in New Jersey. Edison is the name of the new algorithm, a merge of the two platforms Teoma and Direct Hit, being rolled out later this year. “The Algorithm Consistently Finds Jesus”. A play on the evangelistic question, “Have you found Jesus?”, this statement is inviting viewers to try typing “Jesus” into an Ask.com search. Do so and you’ll be pleasantly surprised. The search result comes up with a symbol (cross), a Wikipedia summary, latest news on Jesus, nine sponsored links, nine sites with previews, the opportunity to narrow or broaden the search, and of course the options for images, news, blogs and feeds, AskCity and More. The real test is to see how well other topics stack up on searches. Type in “Duncan Macleod” and you’ll find a Wikipedia entry on Duncan Macleod the Highlander character. Type in “Duncan’s Print” and you’ll find that the last time Ask.com visited this site was in September 2006. Doesn’t look good does it. The algorithm is banned in China. A lot of internet search engines and reference materials have been banned in China, including Wikipedia and Technorati. So what’s this about? “The Unabomber Hates The Algorithm”. This would be a reference to Theodore Kaczynski, known by the FBI as the University and Airline Bomber. His manifesto was centred on a distrust of technological advancement. Ask.com’s campaign isn’t going into detail about how an algorithm works. But they’re keen for members of the public to associate the word with Ask.com, like “Intel Inside”. The Algorithim campaign was developed at Crispin Porter & Bogusky by chief creative officer Alex Bogusky, creative director Dave Schiff, associate creative director Alex Burnard, art director Keith Scott, copywriter John Reid, designers Jason Leiva and David Nadeau, illustrators Surf Melendez and Vanessa Clavijo, print producer Brian McMillen, art buyer Jessica Hoffman. XKCD Cartoon Blog has the Algorithm phrases in tiny print at the bottom of their site. Tommy Keswick poses with the Jesus billboard in a “Join The Flock” t-shirt. Giselle Abramovich at DM News talks about the integrated campaign. Duncan Riley, new writer at TechCrunch, crunches the stats on the Algorithm.